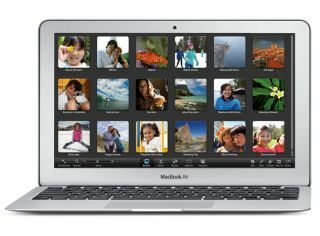 The MacBook Air. Pretty. Expensive. It's a nice Mac. Could it be your only Mac? It's pretty, but it's pretty expensive too. The new MacBook Air is an extraordinarily pretty bit of kit, but it has already attracted some derision, most of which boils down to this: only Apple could expect people to pay nearly eight hundred and fifty quid for a machine running a mere 1.4GHz processor and 64GB of storage. The critics have a point. It's not so much the processor, as the solid-state drive's performance will make it run much more quickly than a similarly-specced machine with a hard disk. And it's not so much the price, despite Apple sneakily adding an extra hundred-odd quid when it did the US to UK currency conversion. 64GB is fine for iPods or iPads, but it's terrible for a proper computer. It's not an issue if you're planning to use the Air as a second machine, of course, but in these straitened times spending the best part of a grand on an extra laptop is something few of us can do. If you're constantly travelling and yet can't afford to fly business class then an 11-inch Mac is a lovely thing, but if you've escaped cattle class - or don't spend your whole time on the move - then the Air is asking a lot of money for a slightly slimmer, slightly lighter computer. Don't get me wrong. I think the Air is a beautiful bit of engineering, and I do think it's the shape of laptops to come; of course flash memory and cloud storage will ultimately replace hard disks and optical discs. For now, though, a 64GB flash disk seems hopelessly small. My iTunes library isn't particularly big, and consists largely of music rather than enormous movie files. It's still 64.32GB. My iPhoto library is 64.87GB. That means I've already got more than 128GB of media, and I haven't totted up my various applications, documents and so on yet. I'm already in Most Expensive Air territory - and I have to buy the 13-inch model, because the 11-inch doesn't offer enough storage. At £1,349 - more, when VAT goes up in January - that's an awful lot of money, especially when the 13-inch MacBook Pro offers double the RAM, better battery life, a better processor and a 250-gig hard disk for nearly £400 less. As I said, the new MacBook Air is a beautiful piece of engineering. It's enormously clever and the shape of laptops to come, and it's better value than its predecessor. But it's horribly expensive compared to its siblings, and it'll remain horribly expensive until flash storage gets to the point where 256GB doesn't require a second mortgage.